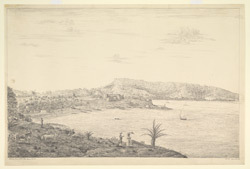 Pen and ink drawing of Sewri Fort in Bombay looking across to Trombay Island by William Miller (1795-1836) in 1828.The image is inscribed: 'Suree from below the Band hill. Bandalah. W.M. December 1828'. Sewri Fort was located on the eastern shore of Parel Island and constructed in 1770. Parel Island, along with Trombay, was one of seven that originally made up the area of Bombay. The artist, William Miller, had a house at Parel. It was located at Vadalla between the towns of Sewri and Matunga. In this view an officer is shown sketching on the left. This figure is probably a self portrait of the artist.